An idea inspired by technology and memory. 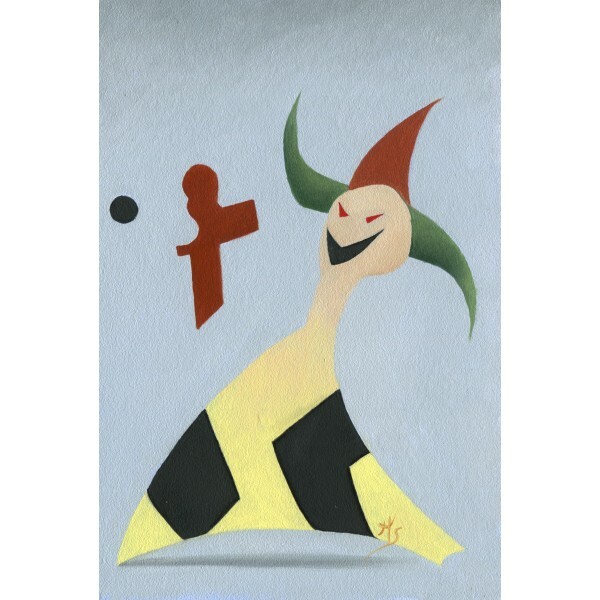 Originally, the body of the jester was made from a circuit board and to perhaps suggest emotionlessness. The cross shape of the jester's is reflected in the broken crucifix, or is this a jigsaw piece? Much of this work was conceived unconsciously, and the idea sketch that became this painting was drawn in 2014. As a child, I had a terror of jesters and harlequins, perhaps due to the TV programme Rentaghost. The religious, or broken religious, imagery, and the emotionally suppressive effect of technology also has links to my childhood, as an obsessive computer programmer from the age of nine or ten.